Tickets are validated through the Jewish Museum Security. Welcome to the Jewish Museum, a museum in New York City at the intersection of art and Jewish culture for people of all backgrounds. Whether you visit our home in the elegant Warburg mansion on Museum Mile, or engage with us online, there is something for everyone. Through our exhibitions, programs, and collection of nearly 30,000 works of art, ceremonial objects, and media, visitors can journey through 4,000 years of art and Jewish culture from around the world. Passover begins at sundown this Friday, April 19 and celebrates the liberation of Jews from slavery in ancient Egypt, as told in the Book of Exodus. Occurring over eight days, this Jewish holiday is marked on the first night by the central observance of the Seder, a ritual meal with symbolic foods that represent important elements of the story. My name is Amy Reichert. I am an architect, exhibit designer, and designer of Judaica, and we’re standing in front of a Seder plate by Ludwig Wolpert. Its streamlined appearance reflects the aesthetic principles of the avant-garde Bauhaus school in which Wolpert was trained. Yet, its function is traditional. 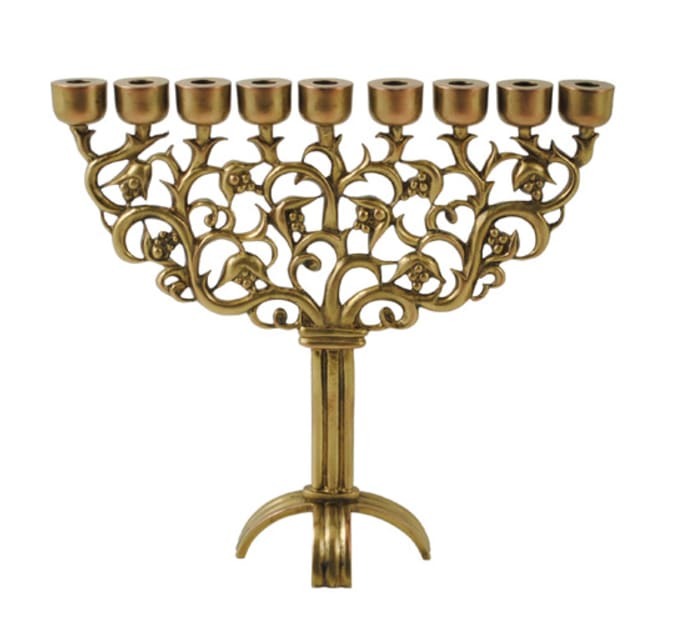 Centerpieces like this one play an important role during the Seder, which is the ceremonial meal that Jews hold on the first and often second night of Passover. The Passover celebration is really the core of Judaism in many ways, which is about being a stranger in a strange land, becoming enslaved, and then being redeemed. So it’s a story that really can resonate across the ages and is specific to the Jewish people, yet kind of expresses universal yearnings for freedom and the ability to take charge of one’s life. The Seder plate itself is kind of the main stage prop that we’re called upon to use. It contains ritual foods that symbolize both slavery and freedom, bitter herbs which articulate the bitterness of slavery in Egypt, springtime green, which celebrate freedom. So we eat some of these, we point to them, we lift them, we really engage with the Seder plate to a large degree. It’s kind of the diva or the star of the show on the Seder table. 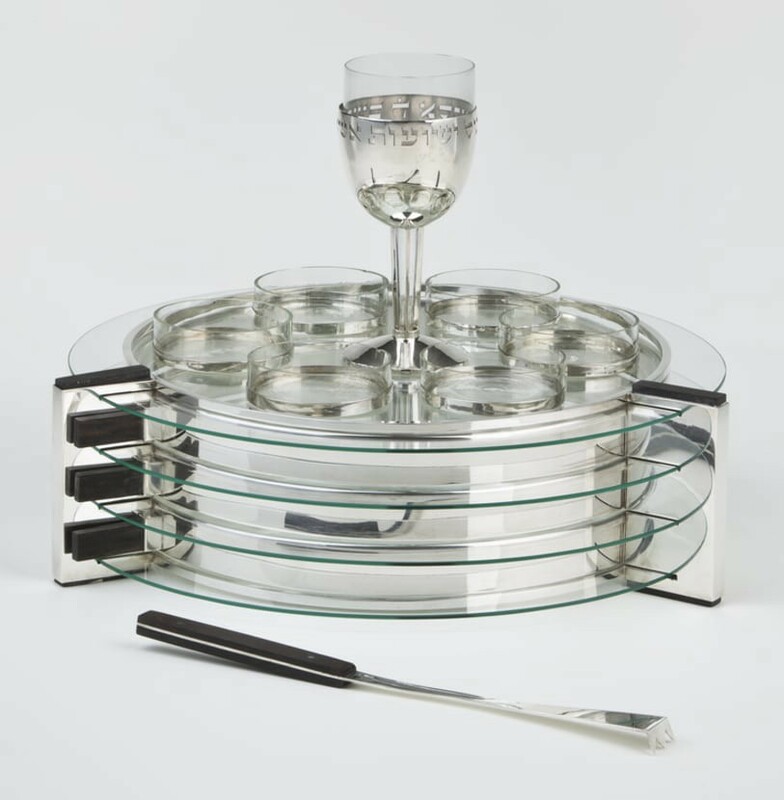 This Seder plate, even though it looks totally modern and really reminds me of nothing so much as a cocktail set from a 1920s screwball comedy, yet it fulfills perfectly the demands of what it’s supposed to hold, what it’s supposed to do. So in a very modern idiom it sort of fulfills all the traditional demands on it. Ludwig Wolpert’s Passover Set is on view now in Scenes from the Collection at the Jewish Museum. Plan your visit during Passover Free Admission Days on April 20, 21, 26, and 27. Learn more about the holiday through more works in the collection online at TheJewishMuseum.org/Collection. 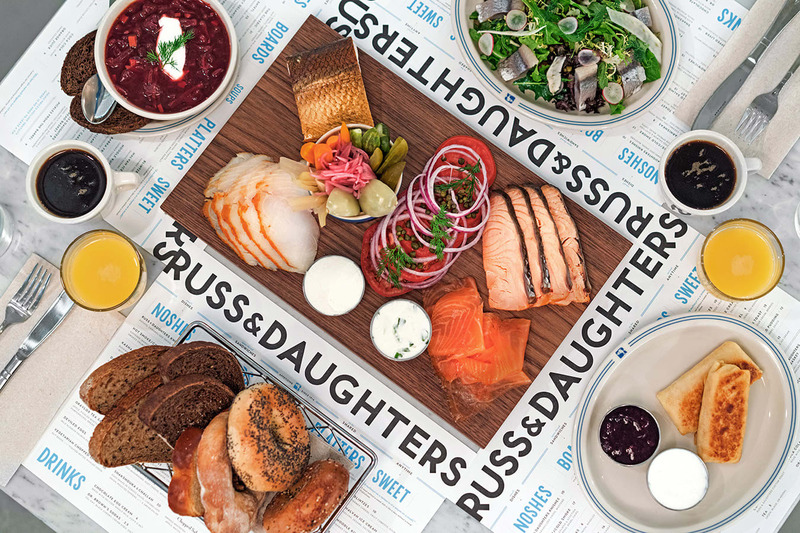 A Modern Take on the Seder Plate was originally published in The Jewish Museum on Medium, where people are continuing the conversation by highlighting and responding to this story. How the Jewish Museum redesigned the user experience of its online ticketing systems with a human-centered approach. 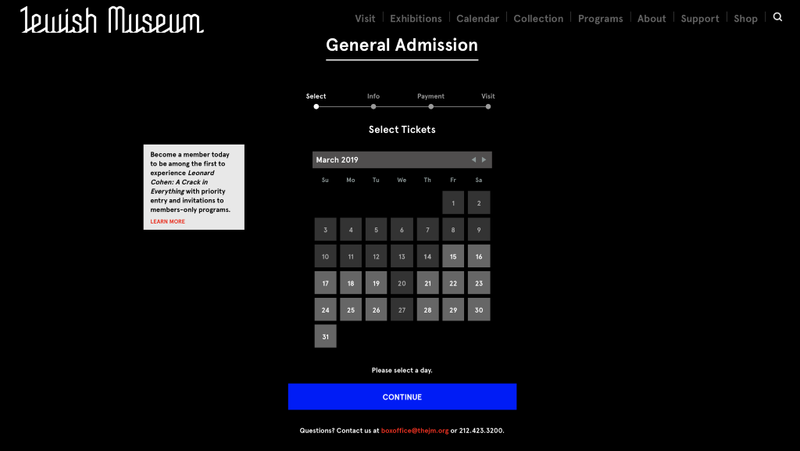 Screenshot of the Jewish Museum’s new general admission online ticketing site, where visitors can now purchase advance tickets to the upcoming exhibition Leonard Cohen: A Crack in Everything. On your last visit to an art museum, did you notice its online ticketing system? 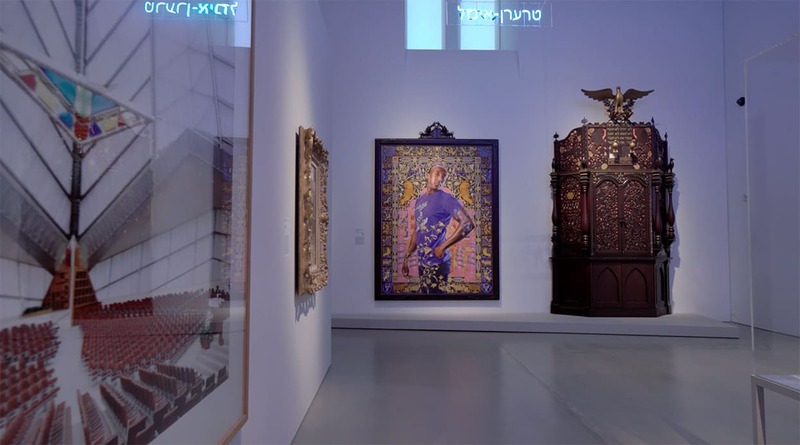 While it’s usually the art that makes a lasting impression, a recent initiative at the Jewish Museum to improve the user experience of online transactions on TheJewishMuseum.org aimed to make the process of purchasing a ticket as enjoyable as a visit to the Museum itself. Whether you are a first-time visitor, a long-time member, or an occasional program attendee, purchasing a ticket or membership on our website should be a seamless and easy-to-use experience. But that was not always the case. For the last several years, the Jewish Museum has leveraged ACME as the technology which powers our ticketing and membership sales both on-site and online. The product was selected for its ability to integrate with Salesforce, the Museum’s customer relationship management (CRM) database, as well as its API (application programming interface), which would enable flexibility to later customize the system for our own needs. Although fairly close to the Museum’s graphic identity and as an e-commerce platform, performed its basic functions, there were certain limitations to the white label product, which also prevented the launch of general admissions online ticketing—a necessity for the visitor experience in the year 2019. Working collaboratively with ACME as well as our web developers at Shift Labs, the Jewish Museum’s Digital team began an enduring, nearly year-long journey to completely redesign the user interfaces of all online user transactions. Today, we are now the first museum to successfully customize the look and feel of all ticketing and membership sales using the ACME API. To achieve this, we used the same human-centered design approach as the rebuild of our online collection: research into desired functionality, prototyping solutions, gathering feedback, and making iterative changes. The main challenge of this redesign project was the daunting task of incorporating all the necessary requirements requested by internal stakeholders. Transactions sometimes also had different and overlapping stakeholders. Any successful design would have to include the requirements addressed by departments across the Museum, including Visitor Experience, Development, Membership, Marketing, and Digital. Lastly, these new forms would have to seamlessly incorporate into the existing website architecture. The design process began with research into best practices of web form design. Since one of the goals of this project was to make these transactions as easy as possible, we wanted to ensure optimal usability for any potential design solutions. We settled on this Nielsen Norman Group article as our guideline, which provides 10 recommendations for web form usability. The next step in the research process was to conduct a competitive landscape review of other online ticketing systems. We looked at other museums, online retailers, and event management sites to garner a better understanding of how different industries are approaching the online checkout processes we are looking to redesign and improve while following best practices. The review allowed us to see what potential users were accustomed to experiencing, as well as provide inspiration for our own design solutions. This research provided a foundation to begin experimenting with ideas using very rough sketches. 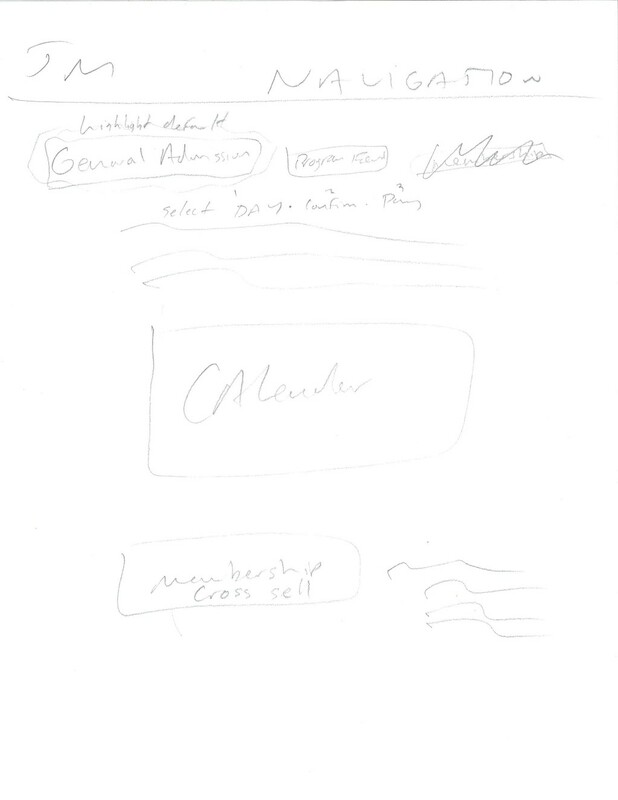 We quickly narrowed down our ideas through this iterative sketching until we eventually were comfortable moving forward with a clear plan to unify the experience of the four transactions. The benefit of this type of prototyping was the ability to quickly receive feedback and easily make adjustments to our design. After a few iterations, prototypes were finalized and we were confident to move forward. Will the user associate the correct action with the effect that the user is trying to achieve? If the correct action is performed, will the user see that progress is being made toward the solution of the task? After completing a walk-through with each paper prototype, no major problems were identified and we were satisfied with the usability of our designs. The next step in the process was to convert all of the paper prototype design interfaces into static digital wireframes using the Sketch design app. The wireframes for each transaction were then connected together to create four clickable, “interactive” prototypes using Marvel. Stakeholders were able to review these interactive prototypes one last time for approval before we began the development phase. The clickable prototypes and branding guidelines were provided to Shift Lab, the developers for this project. The prototypes were used as a reference point between the Museum, Shift Lab, and ACME to ensure that the ACME API was capturing the correct fields in our custom forms. 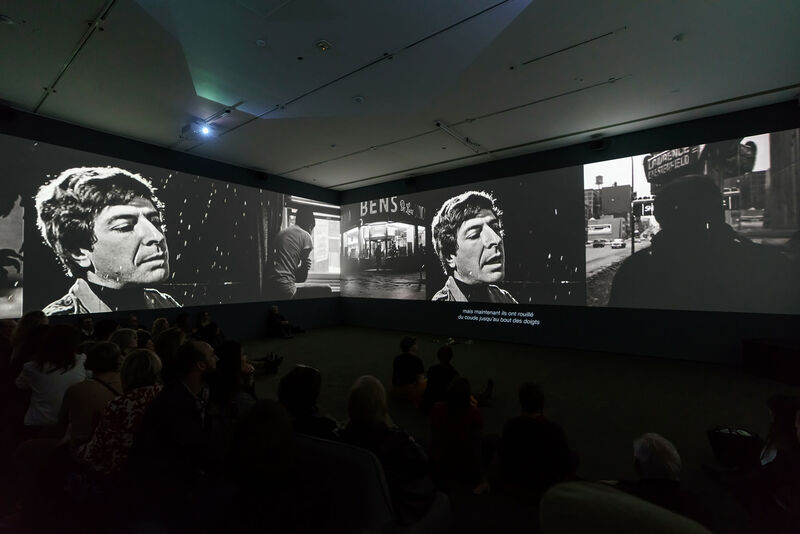 These new transaction pages, including online general admission ticketing, are now live, just in time for the launch of ticket sales for Leonard Cohen: A Crack in Everything, opening at the Jewish Museum on April 12, 2019. We would like to thank the Jewish Museum’s Development, Visitor Experience, Marketing, Digital, and Membership staff as well as the web developers at Shift Labs and ACME for making this project come together. 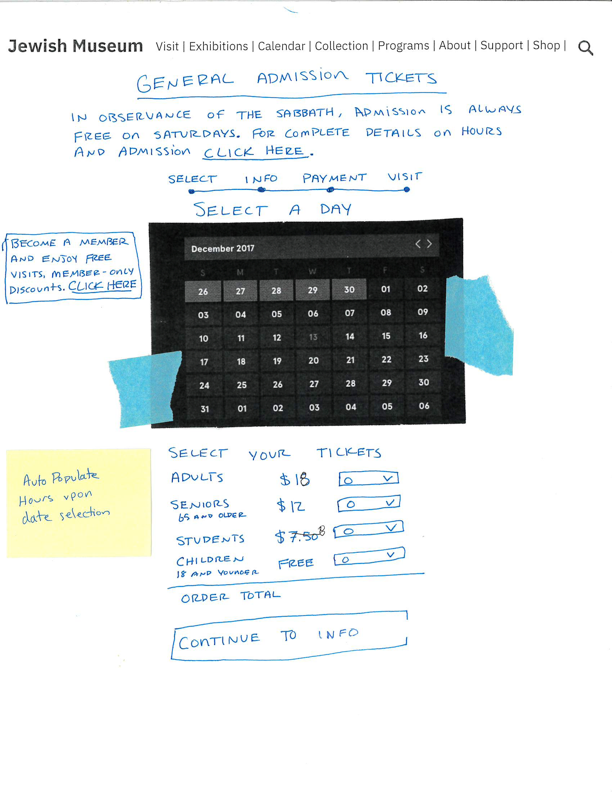 The Art of Online Ticketing was originally published in The Jewish Museum on Medium, where people are continuing the conversation by highlighting and responding to this story. Purim, the Jewish holiday that commemorates the deliverance of Persian Jewry from the annihilation planned by the king’s chief minister Haman in the 5th century BCE, begins on March 20, 2019 at sundown. 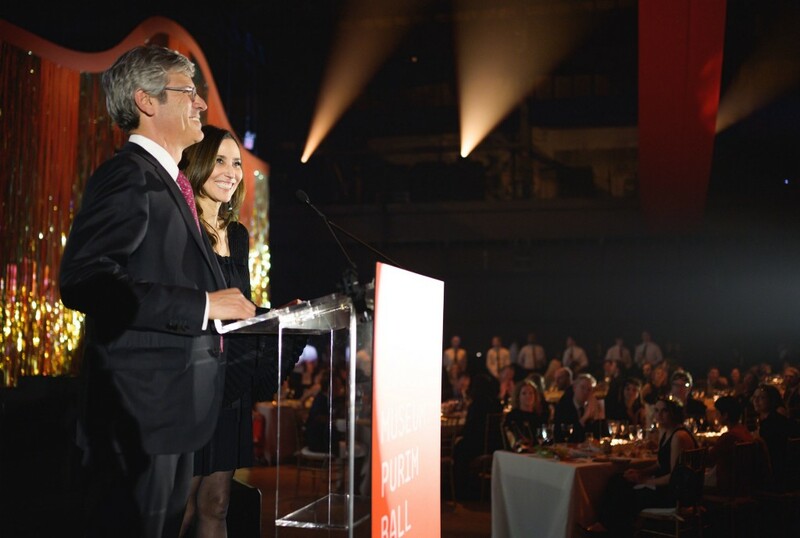 As the holiday approaches, we take a look back at the Jewish Museum’s annual Purim Ball celebration through the inspiring speeches of this year’s honorees — Robert and Tracey Pruzan and The Barnett and Annalee Newman Foundation. 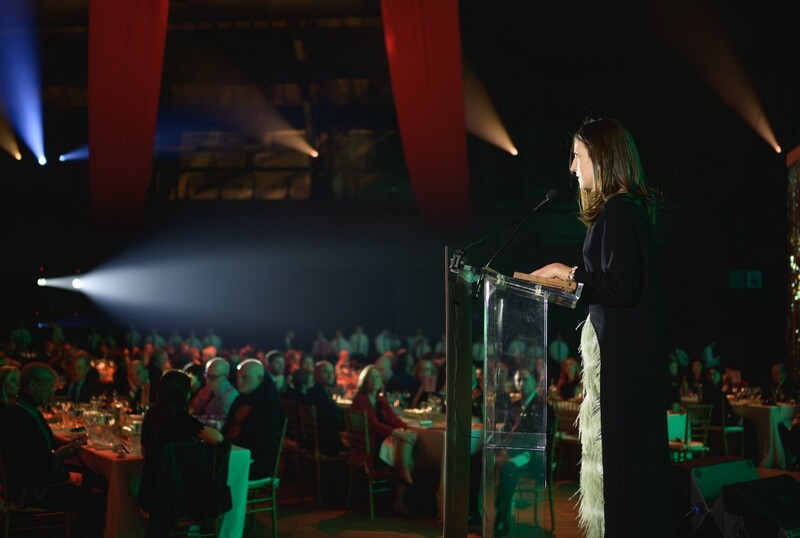 Together with more than 1,000 guests at the Park Avenue Armory in New York, the Jewish Museum’s annual fundraising gala raised a record $3 million in support of the Museum’s innovative exhibitions and vibrant programming. Very often you are asked to introduce an honoree at an event such as this who is well known — but largely a stranger to the organization and to the people involved. That is noticeably not the case tonight. I know that I speak for the Pleplers and the Effrons to say that we are all privileged to introduce Tracey and Robert Pruzan as tonight’s honorees. 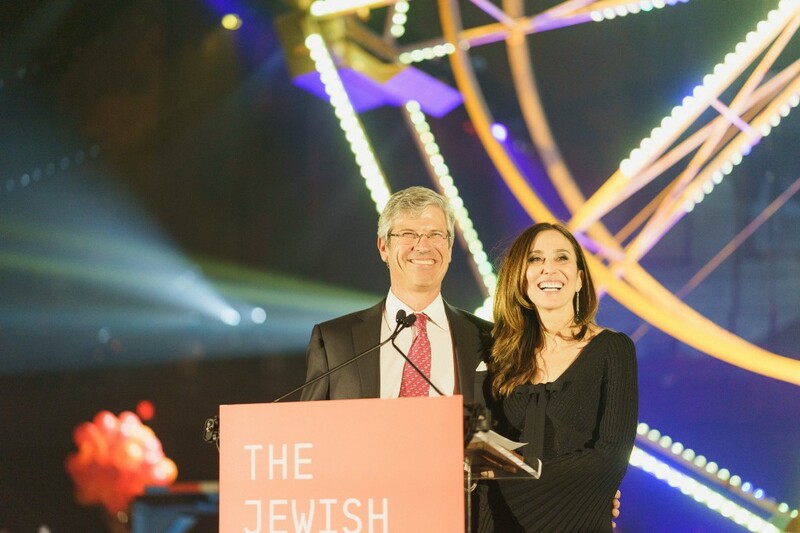 They are close friends to us all and we are thrilled to honor the Pruzans and, in the process, to raise funds for the Jewish Museum. On a personal level, Susan and I have been close friends of Tracey and Robert for more than 20 years. We were brought together as our sons were both students at the 92nd Street Y Nursery School, another important Jewish institution in New York. Our friendship has grown from the early days of staring at our two young sons, to a relationship that spans siblings, children, and reaches across into Robert’s and my professional roles. You all know Robert as a co-founder of Centerview Partners. He has built an exemplary business and is a trusted advisor to a broad and impressive list of corporate clients. Equally impressive, Tracey has been an interior designer at Cullman & Kravis for more than 20 years — she writes and lectures on design, and has co-written three books on the subject. Tonight’s honor is bestowed on the Pruzans not as a simple gesture for their financial generosity — although they have been generous. Instead, we are honoring the dedication of Tracey and Robert to a New York institution that is becoming more important by the day. The Jewish Museum sits on Museum Mile as an institution open to all religions and faiths, but at its core, it is committed to sustaining a vibrant cultural embrace of art that connects the Jewish people and their culture to the world. As Chairman of the Board of the Museum for 7 years, Robert drew me to the board as he energetically seeks to secure the future of the Museum, both financially and in terms of its continued stewardship. The Jewish Museum is ever more relevant at a time when the Jewish people, Jewish culture, and the standing of Jews are being challenged. Good evening. What an incredible night. Looking out at our family, our friends, and all of you who share our commitment to this singular New York institution, Tracey and I are grateful and humbled by your support. First, I want to thank our dinner chairs: Cheryl and Blair, Lisa and Richard, and Susan and Stephen, for making tonight such a success. We’ve raised $3 million, a record for this event, and it would not have been possible without their energy and leadership and of course the support of all of you. We also want to congratulate our co-honorees, the Barnett and Annalee Newman Foundation, and thank them for their extraordinary generosity to the Museum. The Foundation’s choice to direct their historic donation to the Museum is a tribute to our institution. We are proud to welcome the collection of an artist, intellectual, and activist whose work embodies so many of the values and ethos of our Jewish community. Robert and I believe that supporting the Museum is truly a family affair. As some of you may know, art has played a part in our relationship from the very beginning. We met at Wesleyan, where I was an art major and Robert loved taking Art History classes presumably to meet women — and I guess it worked because here we are today! Together, we’ve made supporting art and education a priority. We first became involved with the Museum when I attended the annual spring luncheon, and of course I’ve met so many of you there. Over the years, our dedication grew as we came to love this welcoming place. Now, we embrace the Museum as a place to explore, a place to celebrate special occasions and a place to learn about art through the lens of Judaism. According to a recent Pew study, 62% of Jewish Americans say that being Jewish is mainly a matter of ancestry and culture rather than a matter of religious observance. For us, and for so many of you, the Museum is more than an art-filled mansion on Fifth Avenue. It’s the place where we re-affirm our connection to our community and to our Jewish identity. Purim commemorates the triumph of the Jews over a violent enemy. Tonight, let’s take the time to remember and to mourn the tragic massacre in Pittsburgh last fall, and especially to embrace our need to come together as a family, and as a community — a need which has never been stronger. Believe it or not, it’s been nearly 20 years since I was introduced to the board of the Jewish Museum. Along with Josh Nash, I was once considered the “NICE young man” on the board, and what’s NICE is that they still call me a young man today … though for the record, the Museum didn’t make my hair grey (that’s all of you at table 2). I owe a debt of gratitude to my entire board. Both the long-serving members and Life Trustees — whose vision created a lasting foundation that supports our work. And the newer Trustees — who are bringing a fresh perspective as we adapt to the changing role of museums in modern society and specifically, the role of the Jewish Museum. Today, we are a highly respected component of New York’s cultural landscape. Our scholarship, innovative exhibitions, and dedicated stewardship are appealing to an increasingly younger and diverse global audience. Together under the visionary leadership of Claudia Gould and her creative, hard-working staff, we make the Museum relevant to every visitor, young or old, Jewish or not. As you all know, we are living in challenging times — a time of angry polarization and rising antisemitism. But also a time where diversity and inclusion are ascendant. And this is why the Jewish Museum plays such a critical role — as a place where both tradition and change can co-exist. Rooted in a long history of productive, intercultural dialogue, the Museum is an authority on how to sustain heritage, encourage new paths to Jewish awareness and inclusion, and promote Jewish culture and identity in a complicated and dynamic global context. We visit the Museum to nourish our hearts, to stimulate our minds, and to enrich our souls. 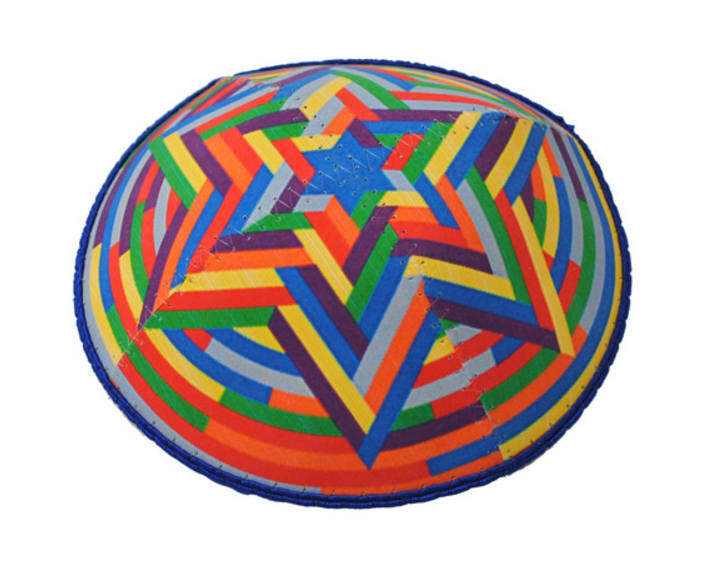 Our programs offer visual delights, intellectual challenges and perhaps most important of all, an opportunity to connect to one’s Jewish identity. Whether you are a practicing Jew, one who only identifies culturally , or just someone interested in exploring and learning about Jewish art and culture, I urge you to join us and support this institution. It is critical, now more than ever before, that the Jewish Museum has the resources and capabilities to serve its mission — to make sure that our stories are told — so that, from generation to generation, we can educate and enlighten all of our visitors about the role we Jews have played, and continue to play, in shaping art and culture throughout the world. 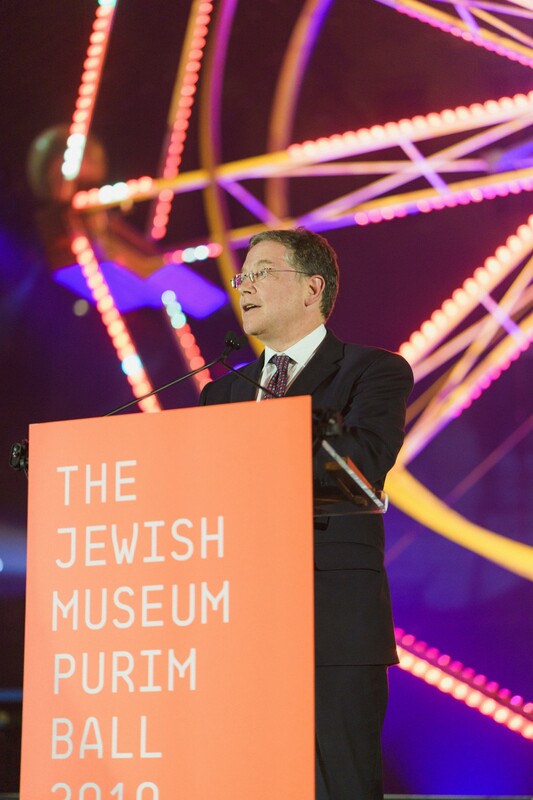 We thank you again for supporting the Jewish Museum, and hope you will continue to do so, as we work together toward a more meaningful, connected, and civil world. Kelly Taxter, the Jewish Museum’s Barnett and Annalee Newman Curator of Contemporary Art, next introduced The Barnett and Annalee Newman Foundation, recognized for its support of the Jewish Museum’s contemporary art programming and of artists whose work exemplifies the Newmans’ spirit of inquiry and independence. Hello, I’m Kelly Taxter, the Jewish Museum’s Barnett and Annalee Newman Curator of Contemporary Art. Very proudly, I am the Museum’s first curator dedicated to contemporary art. I have the Barnett and Annalee Newman Foundation to thank for this honor — as well as for the remarkable artworks they have donated to our collection, spanning generations of artists beginning with works made as early as 1936 and up to the present day. I too, thank Frank Stella, John Silberman, Donn Zaretzky, and Heidi Colsman-Freyberger for making all of this possible. Since our earliest days, beginning with the first solo museum exhibition of Robert Rauschenberg in 1963, the first retrospective of Jasper Johns in 1964 and the iconic, first survey of Minimal Art, Primary Structures in 1966, the Jewish Museum has been a pioneering and steadfast supporter of contemporary art, artists, and now curators. The Barnett and Annalee Newman Foundation recognizes this legacy and extends it with their generous gift. Thank you to them and to everyone here tonight for your support. It is now my privilege to introduce Heidi Colsman-Freyberger, Executive Director of the Newman Foundation. Heidi has been working closely with me on the inaugural exhibition drawn from the Barnett and Annalee Newman Foundation Collection, which opens this Spring, and that I have appropriately titled, “The Gift.” Without her willingness to share her encyclopedic knowledge about the Newmans and their circle of friends, the exhibition would not be possible. 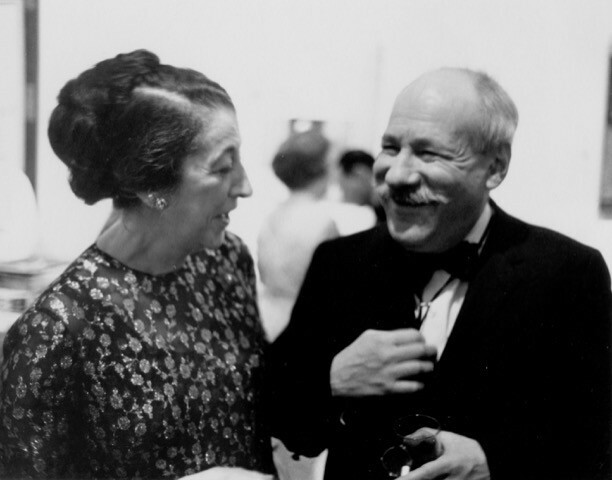 Photograph taken at the 1966 Jewish Museum Purim Ball shows two guests in conversation: benefactor Vera List and Barnett Newman. Fifty-three years later Barney is back, himself a benefactor. Heidi Colsman-Freyberger, Executive Director of The Barnett Newman Foundation, accepted the honor. Good evening — and thank you, Kelly, for your gracious introduction. It is fitting that Kelly Taxter’s curatorial title honors both Barnett and Annalee Newman: theirs was an extraordinary partnership. The Newmans had no children and Mrs. Newman used to say that the paintings were their children and that it was her job to marry them off well. And that she did, placing them in important collections on several continents. With the painting given to the Jewish Museum, her mission is complete. Out of that mission grows another, and Kelly will be instrumental in it. She has reminded us of the museum’s focus on new art in the 1960s: 55 years ago, almost to the day, Jasper Johns’ first museum retrospective had just opened at the Jewish Museum; the truly seminal survey “Primary Structures” would follow in 1966. Counting scholars like Alan Solomon, Sam Hunter, and Kynaston McShine among its curators, this Museum was a celebrated exhibition venue for current art. Also because of their experience, Barney (as everybody called him) and Annalee Newman would be proud that their legacy is connected with the support of contemporary artists and the care of their work at the Jewish Museum. Our best wishes for success go to the museum and Kelly Taxter. Thank you. To learn more about this event and view photos from the Jewish Museum’s 33rd Annual Purim Ball, visit TheJewishMuseum.org/PurimBall. Purim Ball: Supporting the Jewish Museum is a Family Affair was originally published in The Jewish Museum on Medium, where people are continuing the conversation by highlighting and responding to this story. Jewish Museum members help us achieve our mission and also receive great benefits, including early access to exhibitions, free admission, discounts, and more.